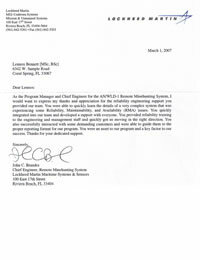 As the Program Manager and Chief Engineer for the AN/WLD-1 Remote Minehunting System. I would want to express my thanks and appreciation for the reliability engineering support you provided our team. You were able to quickly learn the details of a very complex system that was experiencing some Reliability, Maintainability, and Availability (RMA) issues. You quickly integrated into our team and developed a rapport with everyone. You provided reliability training to the engineering and management staff and quickly got us moving in the right direction. You also successfully interacted with some demanding customers and were able to guide them to the proper reporting format for our program. You were an asset to our program and a key factor to our success. Thanks for your dedicated support. Real-Time Laboratories, LLC has been using LebenTech Innovative Solutions as our preferred Reliability and Maintainability Consultant since 2004. RTL is in the business of delivering high quality military spec products for the aerospace and ground defense markets and LebenTech has ably supported us throughout 10 significant new product introductions. Our Reliability submittals encompass all aspects of FMECA and MTBF analyses and we have turned to LebenTech to provide us turn-key solutions. Their comprehensive on-site support has enabled RTL to submit data requirements that are approved on the first-pass. 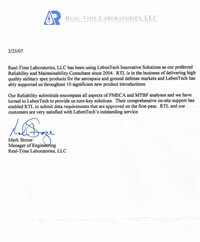 RTL and our customers are very satisfied with LebenTech’s outstanding service. During one of our clean sheet product development cycle, Lennox was able to integrate into our team and worked with our design engineers to develop a testing strategy that focused on reliability growth. The reliability growth method has caught on and many other subsystems are now applying this technique. Lennox also applied and performed other testing methodology such as HALT / HASS to uncover failure modes. Lennox is diligent and very knowledgeable about reliability techniques and analyses. He is a great asset to have on our team.